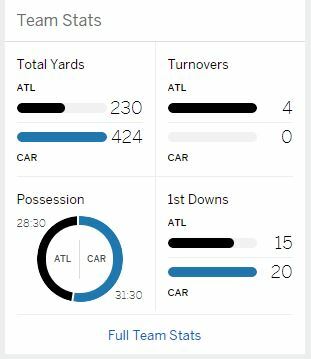 Can time of possession for the two teams of an NFL game add up to less than 60 minutes? Adding these two gives a total game time of 59:42, which is 18 seconds short of a full game. Is there an explanation for this? Or is this simply an error in the source data? That is from NFL.com. It's one second short of a full game. Another error in the data? ESPN also shows the same stat. So, 59:42 might be an error. Not the answer you're looking for? Browse other questions tagged statistics nfl or ask your own question. How do NFL teams do in their last game if they have already clinched a playoff spot? Does a fast paced NFL offense tire out the defense more than the offense? What is the record for most turnovers by an NFL team that won the game? Can a 5-yard penalty be conceded by the defence when the offence is less than 5 yard from the goal line in American football? In the NFL, how have teams fared against odds from Las Vegas?